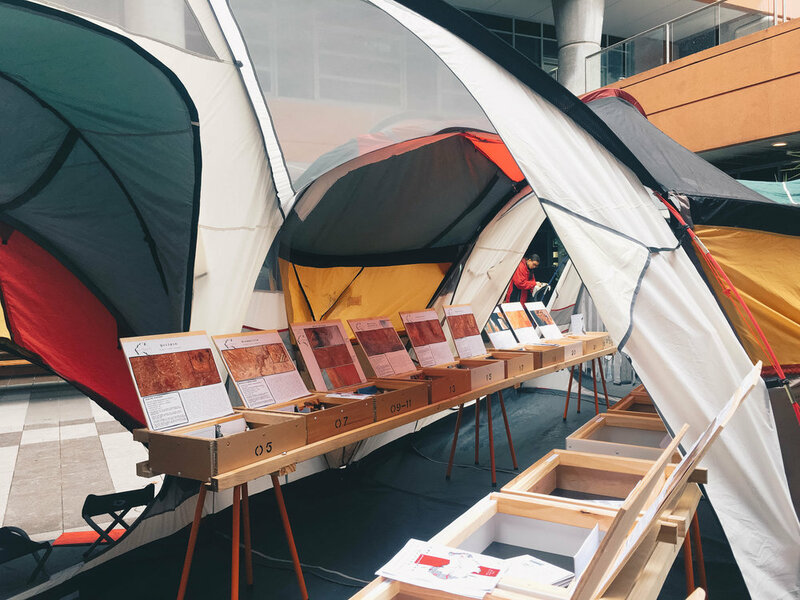 In 2017 Bobbie and Owen undertook an architecture and cycling odyssey from the east to west, through the guts of Australia, including Alice Springs. This was called "The Grand Section", it was a yearlong, 7650km architectural study along Australia's metaphorical heart-line, Uluru's latitude. It was an attempt to better understand their own country slowly and without a bloody windscreen in the way. Through-out this journey Bobbie and Owen were always asking one question "How does place influence inhabitation? ", essentially, how does where we live influence how we live? The pair stopped for one week in 19 places, engaging with locals, documenting and analysing the place; how and why people are living the way they are, and present back their findings to the communities they stayed with. This cross section of studying Australia's Architecture so closely is unprecedented. Now in 2018 Bobbie and Owen have turned "The Grand Section" into a national touring exhibition called, "Girthy; with Slim Edges" which is roaming through towns and cities delivering Australia’s innards to its outer fringe giving insight into the reality of Australia and the regional and remote areas of this incredible country. All out of a recycled tent "art-gallery"! Owen and Bobbie are architecture students from the University of Newcastle who were disenchanted with European and American influences pervading institutionalised learning. They had a desire to learn more about the country for which they were designing, asking the question; "how can we design for a place if we don't understand it?" Their work focuses on regional and remote Australia and the architecture that everyday people live and work with. "...the health of cities depends on the health of rural areas...the pre-condition of all economic life, takes place in the country side...to restore a proper balance between city and rural life is perhaps the biggest task in front of modern man" - E.F. Schumacher, "Small is Beautiful"